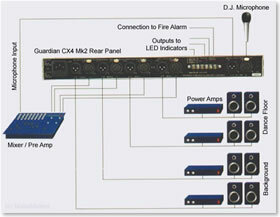 The CX4 interfaces with your fire alarm system. It cuts the music sound level and provides a priority override. The CX4 connects between the mixer (or preamp) and the amplifiers of the audio system. It is a four channel device, usually connected as two stereo pairs. In normal mode (not triggered by the fire alarm) the signals pass through the four channels without attenuation. When the unit is triggered - usually by a fire alarm - the music level is attenuated. In order to avoid panic, it has been found that the music should be attenuated rather than cut altogether, so this is exactly what the CX4 does. The level of attenuation can be adjusted using the controls hidden under the front panel. When the unit is reset, the programme will fade back to the original volume. Reset can be either manual or automatic. The priority input may be a microphone or a line level source. In normal operation, the priority input signal is available at the priority output socket for normal use. When the CX4 is triggered, the priority signal is mixed into the four channels of attenuated music. This is a secondary function that is included with the CX4. It allows you to set a maximum permitted sound level in an entertainment venue. The unit monitors the level in channels 1 and 2 (the main programme channels) and if it goes above the threshold then the LIMIT indicator lights up and the level is attenuated back to the threshold. Two limiters are fitted, one acting on the average level and one based on the peak level. This allows the average and peak limits to be set without undue music compression. The CX4 is a 19" 1RU unit, and so fits well with other standard 19" units. It connects between the mixer (or pre-amp) and the power amplifiers. It can be connected to four channels of audio, usually two stereo pairs. The priority input, which can be a microphone or line level source, connects to the "priority input" socket. This can be a microphone that is in general use, which then becomes the priority mic. for any safety announcements if the fire alarm is triggered. The "control input" is connected to the fire alarm or other triggering device. This input can be either voltage (active high or low) or a switch (normally open or normally closed). Detailed specifications for the Fire Alarm Priority and Sound Level Limited, which cuts the music volume in the even of an alarm activation. Outputs will drive L.E.D.s. directly without series resistors. They will also drive suitable solid state relays to drive mains voltage indicators. Visual indicators Power - 2 x Green L.E.D.s. Priority override - Red L.E.D. Finish Front - and Rear panels- Black anodised aluminium with silver notation which will not rub off in use. Case - black plastic coated steel.